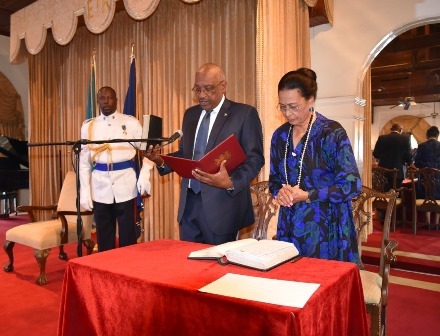 NASSAU, The Bahamas — Newly-sworn-in Prime Minister of the Commonwealth of The Bahamas the Hon. Dr. Hubert Minnis, said, on May 11, 2017, that the day represented “a new day” for the Commonwealth of The Bahamas, and one that was also steeped in ancient tradition. “Today also represents a renewal and reaffirmation of our democratic heritage,” Prime Minister Minnis said, during his Swearing-In Ceremony at Government House. “Exercising a cherished right that is still not universal, the Bahamian people freely elected a new government.